March 2013, Ramallah, Palestinian Territories. 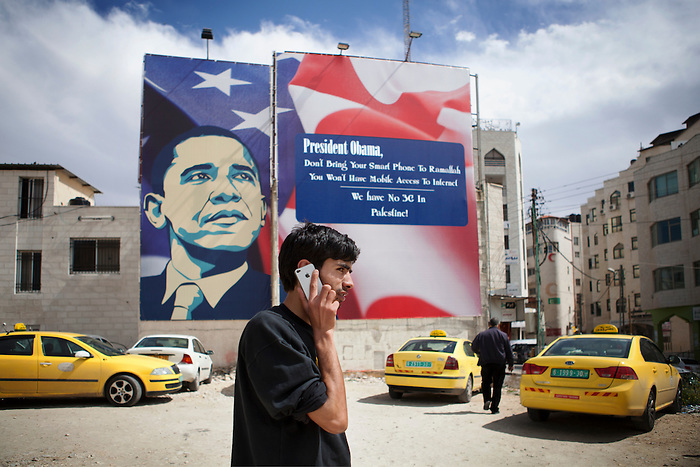 As the U.S. president Barack Obama is expected for official visit in Ramallah, posters have been displayed to catch the president’s attention about the non access to the 3G, due to a restriction that Israel imposes on the waves control for Palestinian telecommunication companies. The reactions to this signs were multiple in the West Bank: Critics against the poster were made, arguing that the 3G network was the least of Palestinian’s problem, and that real human right violation should be emphasized. Most of the posters were vandalized. In the first ground, Jihad, 22, is the parking guard. Born orphan, he struggles to live with 30 shekel a day (6 euro).